We pride ourselves in supplying the general public and trades with high-quality timber scaffold boards. You can purchase new and used scaffolding planks from us and we provide a fast delivery service and we have multiple sizes available in stock. Every timber board we sell will be hard wearing and long lasting, they are also British Standard Kite mark BS:2482:2009 which is featured on the metal band. This is the standard reference for a scaffold plank in the UK. You can create timber shelves and shelving for your house or a shed. You can make different types of tables including a dining table top, garden table, desk or worktop. They can be used for decking or internal flooring. You can use them to build various items of furniture and this can include timber wardrobes, bed frames, a sofa, chairs, bookshelves and doors. You can also construct garden items like fence panels and fencing, planters or raised beds, benches or seating. They are also suitable for paths and walkways. The list is endless of what can be built from a scaffold board, so if you have the ability and time to build things from scratch these scaffold boards are a great product to use. Are your timber scaffold boards treated? No, our boards are not treated with anything. Yes, all of the planks that you purchase from us will be banded, this is to help prevent the wooden board from splitting. The bands are nailed into each end of the board and they can be removed easily but at this moment in time we do not offer this service. Where can I buy scaffold boards? Direct from us, all you have to do is send us your quote and we will get right back to you with a delivery charge and next available date. What is the width of a scaffolding board? Each plank we sell is 9 inches wide. How much weight can a scaffold board hold? These types of wooden planks are heavy duty and a recommended safe working load would be 0.61kN/m (Kilo-newton per meter) and that is spread across four scaffold boards. Can you use the planks that you sell for decking? We do not primarily sell this product specifically to use as decking, however used planks are definitely a favourite choice by our customers to use as decking, but we are not responsible if you decide they are not suitable for your decking project. What is each plank made of? It is always interesting to know what wood our scaffold boards are made from and ours are made from FSC approved European sustainable whitewood timber (its botanical name is Picea abies). How long is a scaffold board? You will find more than just one single size of board that we sell. Current sizes are 8ft, 10ft and 13ft timber boards. If you require a different size, please do drop us a line as we may be able to acquire them for you and your project. How much is each scaffold board? £14.50 each for a 3.9m plank. £11.00 each for the 3.0m plank. £10.00 each for our 2.4m board. You will see our prices clearly stated under each product listing and if you wish to order a large amount please contact us first to see what current discounts, we are able to offer. How thick is a scaffold board? The thickness of all our scaffold boards is standard and measures in at 1.5 inches (38mm). Timber made scaffold boards are used for scaffolding structures and are positioned along the length of the scaffolding lifts to make a safe working platform. 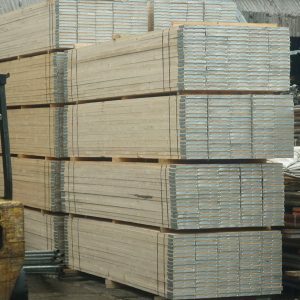 You can purchase various types of scaffold boards that are either made from high quality timber, plastic or even steel that has been galvanised. All of the boards we sell are certified by FSC and sustainably sourced. We are often asked about our board’s specifications by our customers. We understand that knowing the exact size, weight and overall specification of a scaffold plank is important to you when working out quantities for a project or ensuring you are buying the correct type of board to use. Below you will find comprehensive details and information of all the different boards we have available to buy. Please note that the weight of each board could vary slightly due to possible water content. Our most popular board is the Grade A board. These are visually graded for quality to a manufacturer’s standard. A single board has a thickness of 38mm along with a width of 225mm and have bands on each end. Made from: European Whitewood timber and they are compliant to: BS2482 British standards. You can purchase these in various length including 13ft, 10ft and 8ft. Grade A boards have a support span of 1.2m max. These boards are a better grade than A and also comply with British standards BS 2482. Again, these planks have the standard 38mm thickness and have a width of 225mm. These are available in various sizes from 5ft to 13ft. They will be graded either visually or by machine and will have the BS information stamped on to the band at the end of every board. The British standard code along with the manufacture year – for example BS 2482: 2009. M or V to confirm if the planks have been machine of visually graded. Finally, the target span in metres with the word support. These scaffold boards are of a slightly higher grade than the 1.2m target span standard planks but also comply with the British standard BS2482. The have a standard width of 225mm along with a thickness of 38mm. You can buy these from us in lengths including 13ft and as small as a 5ft. The British standard number and the year of manufacture. The identification mark of the supplier. The letter M to verify that the board has been graded via machine. Also available upon request we sell the flame-retardant scaffolding boards. These timber boards have been pre-treated with flame retardants using special techniques that push these chemicals into the structure of the wood. These particular planks are made to BS EN 13501-1 standards which can also be known as Class C or Class B. Upon request we can supply you with a certificate or conformity of treatment. These can also be ordered direct from our suppliers. Our plastic scaffold boards actually have a slightly longer life than the traditional wooden ones and offer better resistance to water, decay and substances. These planks come in different lengths and are all 45mm in thickness and 225mm in width. These boards can be ordered in on request. Our steel scaffold boards conform to British and European standards BS EN 12811. They have been made from top quality galvanised steel. They are 225mm wide and 38mm in thickness. They are primarily used instead of the customary timber scaffold planks. The steel boards are also fire retardant and long lasting. They could be more suited to tough environments. Think we’ve missed something? Then drop us a line. If you require any other information or need extra clarification regarding our scaffold board dimensions, then please do not hesitate to contact our friendly staff who will be able to help you with your query. Information on placing an order with us. When you receive your goods please ensure you check your items before you sign the delivery note the driver leaves. If for any reason you are not happy with any items, we have delivered then please let the driver know and he will return these to our depot and a refund will be issued or we can arrange a re-delivery (please note in some circumstances you may incur another deliver charge for this). We offer payment by instant bank transfer, debit or credit card via PayPal in which an extra 4% will be added to your total cost to cover our fees. Funds must be clear in our account before we are able to confirm and deliver your goods. In the unfortunate instance you receive a faulty or sub-standard item from us, then please send it straight back with the driver for a full refund. We try to ensure that our products are quality checked before leaving our yard but on the odd occasion human error can take place. If you are looking to purchase large quantities, for example over 50 boards then please do get in touch with our sales team as we are always open to offer discounts for larger orders. We offer a fast and efficient service to your door to most addresses in the mainland UK. Our charges do vary, and this depends on the quantity you have ordered and also your location. On average our prices start from £35 but can rise to £80 and above. Please contact us first to find out more. 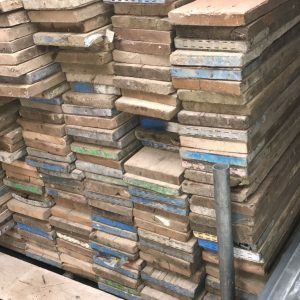 All scaffold boards much be checked on arrival and must match the delivery note, they must also be signed for, if you are unable to be there to take delivery then we can leave your order, but it will then be at your own risk and we will not be responsible for damaged goods or missing items etc. Our delivery service operates Monday through to Friday 8am until 5pm only. 95% of our deliveries are made using large lorries including a 7.5-ton vehicle and a 25-ton vehicle so we will require information regarding what the access is like to your delivery destination. You must also provide clear and easy access for the drivers to pull up kerbside or as far as the vehicle can go to off load your goods. Unfortunately, the drivers are not permitted to carry or walk any items to another area. We are not responsible for any accidents that may occur when using any items purchased from us, you are responsible for using these in a safe manner and we always advise that only qualified persons should operate any product sold by Sussex Scaffolding Supplies. We will also not be responsible if we are asked to leave your scaffold boards without a signature, they are your responsibility once the driver has left them.